A few years ago, my brakes started making noise whenever I pushed the brake pedal. I procrastinated quite a while before I took the car into the shop because I didn’t have the money for the repair. However, because I waited so long, the brakes had worn down to the rotors, so my repair was much more expensive than it would have been had I come in right away. But Wait! I Hadn’t Learned the Lesson Yet! You would think I’d have learned my lesson, but no, I haven’t. We own a minivan that is 11.5 years old and has 167,000 miles on it. A while ago, one of the back sliding door handles broke, so we could no longer use it from the outside. No worries. We simply herded all the kids in through the other side door. Was it a pain? Just a little bit, but we didn’t want to spend $200 to $300 on a door handle repair when we had so many other pressing expenses. But, then the other sliding door broke. The wire coil started to fray, so we couldn’t open the door. The repair for the outer wire coil? A cool $900 to $1,000. Ouch. So, we started opening the driver’s side door and reaching around to open the side door with the outside broken handle by using the inside handle. By now, we were starting to feel a bit, um, special, I’ll say, because of our unusual way to open the door. Still, we put off the repair because we had other expenses like a $210 garage door repair and a $90 air conditioning tune up along with a $900 deposit for braces for our son. All was okay until the inside door handle broke. Now, the only way the kids can get in and out of the car is through the front doors. The special meter has gone up enormously, and even the kids are talking about how embarrassed the are to get in and out of the car. Now that the repair is inevitable, I called the shop to find out the repair will likely be $400 to $500 because they’ll have to remove the door and replace both the inside and outside door handle. Lesson learned. When a repair is needed, make the repair. If you don’t, you’ll likely end up paying more in the future. Raid your emergency fund. This is the easiest. If you have an emergency fund, use the money and then rebuild the emergency fund as quickly as possible. Have a pantry challenge for a week. We spend approximately $150 to $200 a week for groceries. By taking just one week to eat only what we have in the house and not going to the grocery store, we could have had the money for the handle repair before it got worse. Lesson learned. Sell stuff. Everyone has stuff around the house that they don’t need or don’t use. Sell things at second hand stores, sports resale stores, or eBay or Facebook. You’ll be surprised how quickly the money will add up. 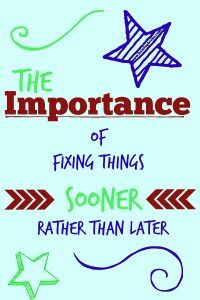 Do you procrastinate on repairs because your budget is tight? If so, like us, has that rationale ended up costing you more money? Are You Ready for a BIG Emergency? 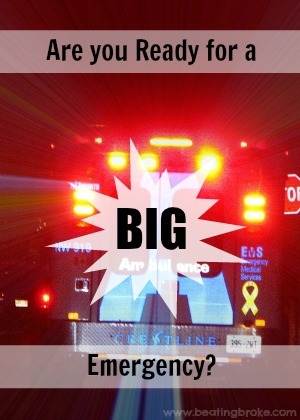 Are you ready for a big emergency? Do you have the required 6 to 12 months’ emergency fund? I can hear your groan now. Who has enough extra money to put aside 6 to 12 months in the bank? If you have expenses of $3,000 a month, an ample emergency fund of 6 to 12 months would be $18,000 to $36,000. Definitely not small change. An emergency fund is hard to build, and that may be part of the reason why many people never even try. But there will be an emergency that will occur sometime in your life. You will need that money. We relocated to Arizona 10 months ago. Doing so drained our meager emergency fund. For a few months, we were doing pretty good and getting back on our feet until we started facing endless financial nicks—braces for our son, $2,000 in medical and dental expenses, $1,500 in car repairs, etc. The last five months have been financially very difficult. If we would have had a 6 to 12 month emergency fund, our job now would be to rebuild the emergency fund, not do constant damage control. I think it will be a few more months until we are financially in the clear, assuming no other major expenses come up. Meanwhile, we feel extremely vulnerable financially. However, our current financial difficulties are nothing compared to what others face. My daughters’ therapist is living a financial nightmare. Her husband had a stroke and now has locked in syndrome, which means he has his full mental faculties, but he can’t move his body. He is no older than 40. No one would expect this to happen. The therapist’s life now is driving to see her husband and advocate for him as well as juggling the finances of losing one income as well as the rapidly mounting medical expenses. She does work but has had to take frequent days off. Even with a Go Fund Me page that brought her nearly $50,000 in donations, I have no idea how she is handling the expenses. Of course, this is a worst case scenario, but still, an emergency fund to liquidate in this situation would be nice. Right now, my husband and I are struggling to stay out of debt. So far we’ve succeeded, but we’re right on the edge. Still, our plan is to put a small amount away in our emergency fund, say $50 a month. Something is always better than nothing. In the next few months, we’ll amp that amount up to a couple of hundred a month and keep increasing as we are able. We won’t have a sizeable emergency fund anytime soon, but we will have some money put aside. But that’s short-sighted thinking. Look at your finances and ask yourself how would you be financially if you had several smaller emergencies of a few hundred or thousand dollars or if the worst case scenario happened? My advice is to wait to splurge until you have that emergency fund. Trust me, one day you’ll be glad. 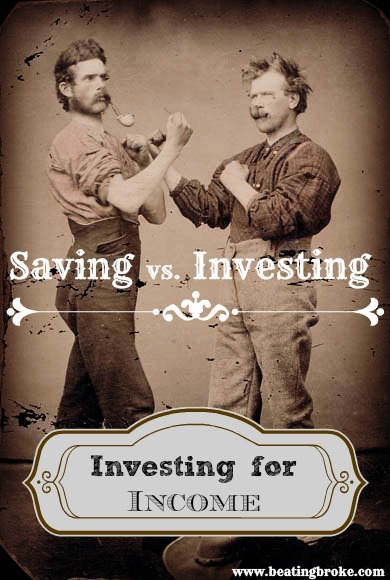 Do you have a 6 to 12 month emergency fund, or do you find it too difficult to achieve?